CBS Survivor auditions are coming to various cities next month looking for the next contestant to go after the $1,000,000 prize. Do you have what it takes to outwit, outlast and outplay even the most devoted Survivor fans? If so, here is a chance to land a very coveted spot on CBS’s Survivor. The new season of the show is now casting and the Survivor tryouts are coming to various areas of the United States to hold video taped tryouts for the show. Survivor is a hit reality show, one of the longest reality TV shows currently on Television. Survivor takes a group of strangers and drops them off at a remote location. The group is split up into 2 tribes which battle each other in various physical and mental challenges. Each week the losing tribe votes someone off until the 2 groups merge, more people are voted off and eventually 3 players remain. When the show is down to 3, it is up to the voted off cast members to crown a winner. After a vote, one contestant will get crowned the lone survivor and claim the prize of 1 million dollars! Open Calls are held by our local CBS affiliates. They will be putting you on tape so there is no need to bring anything, but your ID to the open call. The time to apply for Survivor 39 and Survivor 40 is NOW. We are actively casting. This page will also be updated with more open casting calls as they come up. Well I cannot apply as I’m from the UK… I would have been the perfect candidate for survivor. I’m a gym junkie and a very outgoing individual.. I love the outdoors hiking.. camping living off the land. I am a survivor TRUE STORY. Sent me the dates and times close SD and I’ll be there this my favorite show and my dad’s last memory. Play hard, work strong and stay stable. I’m the next survivor. does anyone know if Canadians can apply to try out or not ??? Survivor when will you have open calls in or around the Chicago area or Springfield Illinois? I live in between the two cities and would love to try the open call. I will be applying again first week of October. quisiera participar es mi sueño mas preciado. pero estoy muy lejos de alcanzarlo soy de venezuela, y no tengo recursos para viajar. solo seguire viendo las temporadas por tv. es maravilloso ver como cada jugadas hay que estar atento hasta de lo mas minimo. 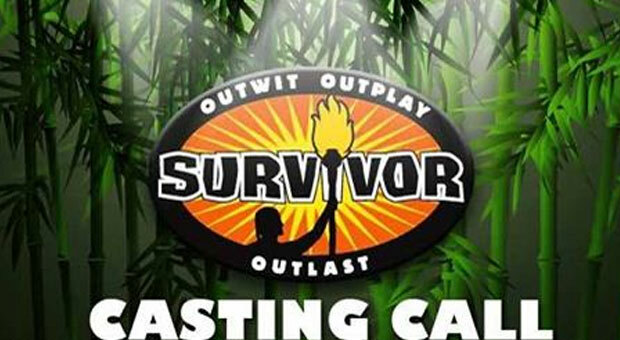 dios dame la oportunidad de estar alla..
Would want to enter for Survivor. I am from South Africa. Is there a place to send a response, that I will be there? 3rd degree black Belt, a CrossFitaer, runnner and Salsa dancer, what a combo hee he, also a mom of a 24 and 21 year old boys. You should have contestants tied to political parties….. republicans versus democrats versus independents. I’ve been watching Survivor for many years now. Not everybody has what it takes to play the game. Most people signup just to be on television. I would be the person that everybody would want to watch. I am so a people person. Also I have been working in Law enforcement for approximately 10 years now. I am interested in information about applying. We do not live in the area listed for casting. How do we apply online. There is no direct link. Hi. Is there a form or protocol to contact the local CBS affiliate to have the 1-minute audition tape made? I have watched this show since the beginning. I would love to try it out. I also need to get out and enjoy life and see the world PLEASE PLEASE look at my application cause I enjoy the show and am wanting so bad to find out what it’s like to support my husband & I, both of us are low income and it’d be great if I could do an adventure just once.